The John Muir Trail (JMT) runs 223 miles from Whitney Portal to Happy Isles in Yosemite Valley, crossing some of the most rugged and remote country in California. The JMT traverses Yosemite and Kings Canyon National Parks, and the John Muir and Ansel Adams Wilderness Areas (Inyo National Forest). The southern terminus of the JMT is "officially" on the summit of Mt. 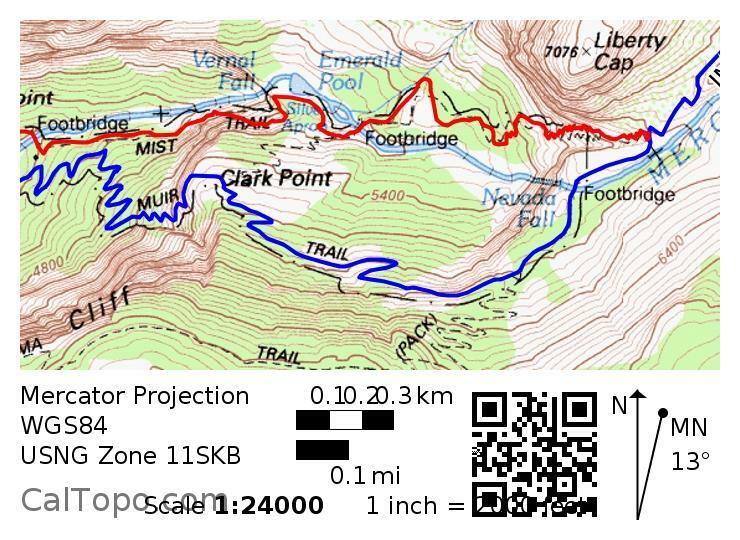 Whitney (14,495'), and hikers/runners must traverse an additional 11 miles between the summit and the trailhead at Whitney Portal (8,500 feet). Click here for a profile of the route. For FKT purposes we consider the JMT to be a TH-to-TH (pavement-to-pavement) route, but we also report Whitney summit times. 1) Red's Meadow. 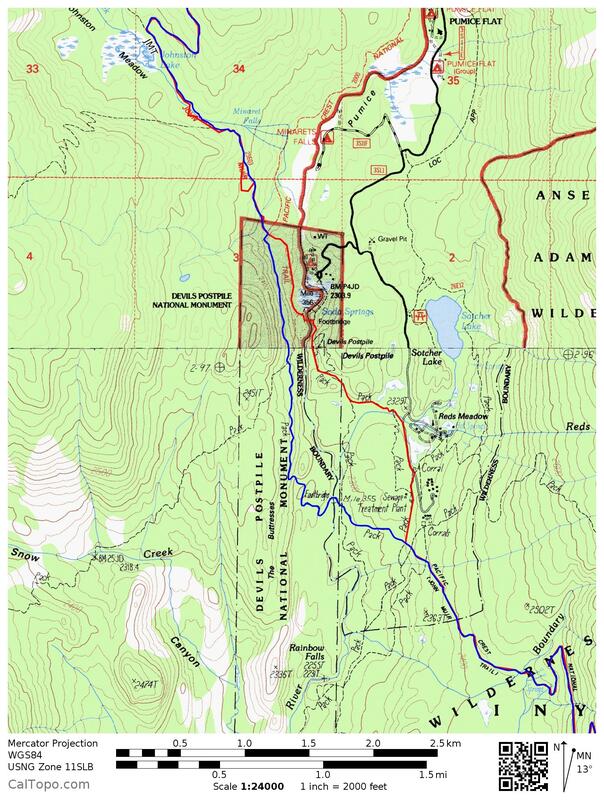 The JMT does NOT go to or through the campground or to the store, but stays mainly west of the Middle Fork San Joaquin River through Devil's Postpile National Monument. Follow the blue line on this map, NOT the red line. 2) Tuolumne Meadows. 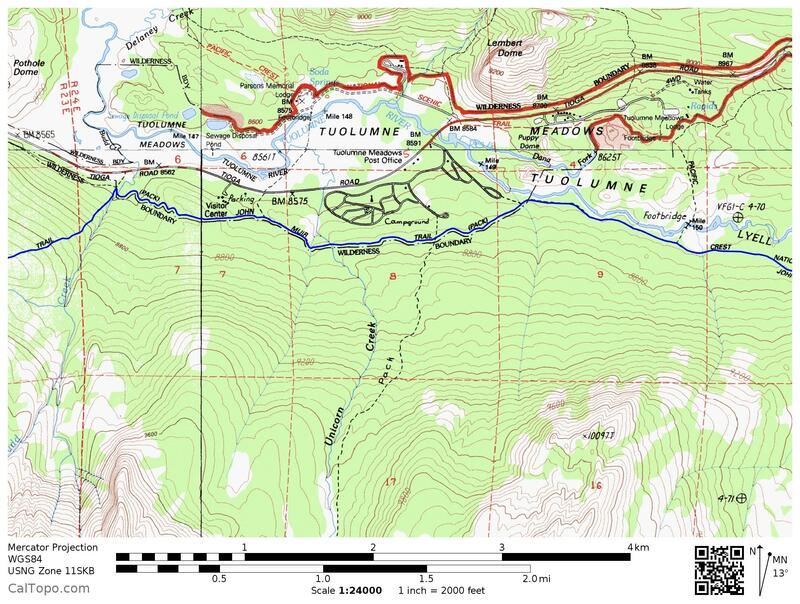 The JMT stays south of the campground and road, as per the blue line on this map. If you leave the JMT to go to the campground (etc.) you must return to the JMT at the same point! 3) Yosemite Valley. The JMT is on the south side of Nevada Falls. On a northbound trip you must cross the Merced above Nevada Falls at an obvious sign. DO NOT take the Mist Trail! Follow the blue line on this map, NOT the red line. Speed attempts on the JMT have largely been done south-to-north (Whitney to Yosemite). This makes sense because the Whitney Portal TH is 4300' higher than the Happy Isles (Yosemite) TH. Also, NoBo trips get the higher, harder terrain over with earlier, while the hiker/runner is still relatively fresh. On the other hand, the majority of all JMT thru-hikes are done in the other direction (SoBo), probably because that direction allows for hikers to acclimate to the higher, southern altitudes more gradually. We report FKTs separately for each direction. I think that to hold a record in 1948 you had to at least jog the trail as late into the night as you could see, eat very little and drink out of streams. My husband was exceedingly self-reliant, fearless and needed very little in nature. He could just throw himself down anywhere on the ground and go to sleep. But someone must have timed him and obviously, his time was formally entered because he knew he had set the record. All he did say, in self deprecation, was that the record was superceded virtually immediately in the next year or two. - Christine Speed, June 15, 2005. In the age of the internet it has become much easier to keep track of the records. Nevertheless, prior to the FKT trip of Peter Bakwin & Buzz Burrell in 2000 the actual record was murky. They concluded that Jim Knight held the record from Whitney to Yosemite (around 4.5 days), while Blake Wood held the car-to-car (from Whitney Portal) record at 4d22h, Aug. 9-13, 1998 (Jim had slept on top of Whitney.) Burrell & Bakwin beat both times on their trip (4d14h39m from Whitney Portal), but didn't reach their goal of 96 hours, car-to-car. Their trip reports are archived here. Some interesting discussion of the Portal vs. Summit issue, and other JMT items, is on at this thread. We later learned via John Rosendahl that Don Douglass did the JMT supported in early August 1982 in 4d21h30m from Whitney Portal to Happy Isles. This time would appear to beat Blake Wood's 1998 time. The run was reported in the LA Times (8/11/1982). Douglass started with 6 companions. Nicki Lewis and David Hermitage finished the trip in 5d16h, while Greg Laval, Bob Holtel and Fred Copeland did not finish because of injuries. Lewis' time may have been the fastest by a woman up until Sue Johnston's 2007 trip, though Catra Corbett apparently did the route in 5d15h50m in 2004 as the first leg of a yo-yo (which she completed in 12d4h58m, which I think is the overall yo-yo FKT). Peter Bakwin went back in 2003 and did 3d22h4m solo, supported, Whitney Portal to Happy Isles. His trip report is here. About a month later, Flyin' Brian Robinson failed to beat Bakwin's time due to getting lost in a sleep-deprived fog on the final night. The next year, Kevin Sawchuk ran it in 3d21h5m. The record was lowered to 3d20h0m by Sue Johnston in 2007. Johnston's time was the fastest by a woman for 10 years until Darcy Piceu's remarkable run in 2017. Michael Popov took serious stabs at Johnston's supported record in 2008 and 2009, but failed both times. Davis' starting pack weight was 18 lbs, including 10 lbs of food, which consisted entirely of the Hammer Nutrition sports drinks Perpetuem and Recoverite. In his report he discusses the bear canister issue -- Davis did not carry one. What is this disgusting yellow crap I'm coughing up? Should I be concerned? -- Brett Maune, hours after completing his JMT record. Speed trips on the JMT have generated in some amazing stories. In the honorable mention category, John Tidd did the JMT north-to-south starting at Happy Isles at 4:14 a.m. on September 1, 2017. Tidd made it to within about 400 yards and 350 vertical feet of the Whitney summit, but then turned around at 4:07 a.m. on September 4 (just under 3 days) due to being unable to find the summit in the dark & fog, exacerbated by wind and fatigue. Had he been able to continue to the summit normally (or waited until daylight???) he would clearly have bested Panilat's Summit-TH time of 3d4h30m, and almost certainly the overall TH-to-TH FKT as well. Below, Tidd sums it up as follows: "Alone near the summit with no moon, no cell phone battery and in very windy and foggy conditions with poor sense of balance from limited visibility and fatigue and I could not find the summit and after going to what seemed to be the end of the trail (a large block of rock blocked or marked the end of the trail) I could not find any indication of where the summit was and turned around. Comparing GPS files I seemed to have been 125 meters of elevation from the summit. I was warm with my puffy jacket but sitting put and waiting for others or daylight never entered my mind." Tidd posted a detailed trip report on his Facebook and here (which is on page 13 of this thread). We note that Tidd took a route variation through Reds Meadow, and was off of the official JMT route in that area for about 2 miles, which would certainly have generated controversy had he completed the JMT and claimed the FKT. Times in parentheses () are using Mt Whitney summit as the southern terminus, others terminate at Whitney Portal. P.S. My SPOT is strapped to my pack, which I’m planning to leave at the trail crest junction when I go up and tag Mt. Whitney, so you won’t see any dots at the summit. I’ll take some pics from the top in case verification is in question. Just got home, wanted to give a few details since I’ve had some questions. Thanks a ton for all the support, it’s exciting to see people interested in our silly endeavors. I’m ecstatic with how things turned out, based on last year’s trip I figured 4 days would be a stretch and had put the record basically out of my mind. Not that I wasn’t doing the math on the trail, but I far exceeded what I had set out to do. So the sleep thing on the third night [prior to the 3rd night Sean was close to or on FKT pace]. I had a deep dark lull making my way from Virginia lake to the downhills to Reds, that section just seemed to go on forever and I was getting pretty frustrated. I was out of water so couldn’t eat anything, so the only thing I could think of to to break myself out of the funk was to start hammering the downhills and produce some endorphins. This worked, and by the time I got to Reds I was feeling good again. My plan was to sleep a few hours when it got dark, which I tried to do but couldn’t sleep since I was still jacked up from the run down to reds. Since I couldn’t sleep, I popped a few vivarins and pushed up the hill, which was a bad idea and left me loopy. I barely remember going to sleep that night, and I’m not sure how long I was out for but slept until about 3.30 AM, at which point I fired back up and was able to keep my act together. Managed to hold on to the finish after this. Also, I had sort of forgotten about Brett’s time since Cathedral pass (and it’s subsequent ridges) took forever. I though I was hours behind him. As I was coming down the last switchbacks from Nevada Falls I changed my watch to elapsed time and realized I was neck and neck with him. I broke into a dead sprint for the last two miles, but they obviously installed a few extra switchbacks and uphills around Vernal falls, so I let it go and finished 4 minutes back of him. Looking back, probably shouldn’t have used the bathroom and lounged in the river at the top of Nevada Falls. 4-5ish hours rest total on the way up to Shadow lake? i will be this upcoming Friday at 10am PST time making a second unsupported FKT attempt NOBO after my first failure in 2017. Like Sean, my primary goal is to finish, under 4 days, and we will see how close I can get to Andrew's time if I happen to succeed. i will be taking videos on the trail and particularly at whitney summit. Last year I quit at Red Meadows feeling miserably, after 260km, 65 hours, and 1h30 total of sleep. I was thinking nutrition was my biggest issue, but without any certitude, and this is what I was hoping to figure this time. This year I started this second attempt with many doubts: physically trained but slowed down due to many knee injury, and long event nutrition not dialed in yet. I would have a long good night of sleep before starting. I would be fresher to face the first night when sun is setting at 8PM. Finishing at Yosemite before a 4th night at 8PM if I match the record pace. My strategy was to start strong, to always stay ahead of Andrew times, and then manage my advantage and my rest time depending my needs, trying to stay ahead of schedule. 0h / 0 km / Whitney Portal: I was suffocating by the stress and adrenaline the first 20min once I started, even more than last year, it was like if I was in an airplane, and I was about to jump out of it without wearing a parachute. I was then anxious to know my time at the summit, I felt fast last year doing this in about 3h35min, and I was scared to be much slower, so I continued uphill strongly until I reached the summit. 3h12min / 17 km / Whitney Summit: I am already at the top of the contiguous US in a personal record time, I now feel more confident, but the route is only starting. 9h / 52km / Forester Pass: I continued towards Forester Pass without any issues, alternating jogging and walking, and arrived there within 9 hours, which is 1 hour faster than last year again. I could not expect anything better than this, and I am gaining again more confidence. I was able to eat and drink properly every hour, did not take useless break, everything went perfect, so far. 10h / 60km / Vidette Meadow: It is now 8pm, and the sun is setting as I run down. It is getting colder, I still feel strong, and I get ready before starting a full night of hiking. 12h30 / 72km / Glen Pass: It has been full night for some time now, and I am starting to feel the exhaustion going up Glen Pass. I arrived at the top of the pass at 10:30pm, still making good progress, being 1h30 ahead of schedule. 15h20 / 90km / Woods creek: The way down to Rae Lakes then was even more difficult, the trail is technical on the top, with an uneven rock terrain hard to step on at night. This is how I lost about 20min going down to woods creek, but I was still able to keep a good pace regarding the freezing temperature and the dark environment. 18h15 / 99km / Pinchot Pass: Last year I felt very exhausted going up from woods creek to Pinchot Pass, and I was hoping to feel better this time. I felt better, but I felt more and more exhausted, and especially cold, it is around 0 degree Celsius out there now. I am still 1h15min ahead of schedule, and it is now 4:15am, I can’t wait for the sun to rise again. 19h45 / 107km / Kings fork creek: I kept pushing on my way down to keep my time advantage, until I reached the bottom at 5:45am. The sun was rising now, and I tried to have a nap next to the creek since I started to feel very exhausted after almost 20 hours of hiking, but it was still freezing cold, so I decided to keep moving a little more towards Mather Pass. 21h30 / 110km / Before Mather Pass: At 6:30 I am finally laying down just before Mather Pass for what was planned to be a 2 hour nap. Every time before each nap, I had a specific routine always in this order: free my feet from my shoes and socks, drink bunch of water, drink recovery powder, eat consistently, stretch and massage painful area, and try to sleep. With the sound of water flowing next to me, and the floor still feeling cold, I was barely getting asleep, and decided to move again after a break of 1h15, and maybe 20min of sleep total. Before leaving, I refilled my two 500ml soft flask full of water, but by clumsiness I dropped the cap of one of the soft flask into the river (I felt sorry about that by the way, so I picked up some trash I found on the way to compensate my impact). From this I would need to continue with only a 500ml container, which should be ok on this trail, but a bit risky and not convenient. 22h50 / 115km / Mather Pass: As the temperature was rising again, I felt my throat more and more painful, like if I got sick again this year due to the cold of the night. This was not very promising, but I made it to the top of Mather Pass anyway at 8:50am, hoping my throat would feel better later. 27h15 / 140km / Le Conte Ranger Station: The long descent towards Bishop junction was painful at the beginning because of the technical terrain but was getting easier in lower elevation. I arrived at Bishop junction at 1:15pm, making a big gap with my schedule, since I skipped a long 3h30min break that I did not feel the need yet, the sun keeping me awake, and the food keeping me in shape. From Bishop junction, the trail was starting to go up towards Muir Pass, and I was about to face one of the biggest suffering so far. 31h20 / 151km / Muir Pass: Temperature were getting higher than I thought, and my throat was now even worse: I felt like I had asthma, and when the cardio was going up as the trail was going up too, I was unable to breathe, in complete suffocation. I was unable to make any progress at all, stuck every few meters trying to get back my breath. Thus, I decided to take onehour break on the way up. I did my routine and tried to get some sleep … but now there were insects everywhere, enjoying my arms and legs, keeping me awake for most of the time. I maybe got around 15min of sleep this time. It was time to keep going, and I got motivated when I saw a lake, since I remembered last year there was a lake just before the top. I actually did not remember there were three lakes on the way, and every time I was thinking I was there, I was actually not, and my motivation was dropping very fast, while I was still in complete suffocation. I finally made it up to Muir Pass at 5:20pm, 3h20min ahead of schedule, keeping still a good advantage. 36h30 / 175km / Goddard Creek: I felt now confident about my throat, because a long descent was waiting for me, and then finally the night. This is the first time I am waiting for the night to arrive, because I hoped for the throat to clear with the cold temperature. I took a break of 45min just before Evolution creek at around 8pm, getting about 30min of sleep this time. And magically when I woke up, my throat was clear again! 41h50 / 197km / Selden Pass: The second night started, and I then continued towards Selden Pass. I was about 2 hours ahead of schedule before going up the pass, but the exhaustion started to be very present still I have not rested much in the last 40 hours. I had to make some short stop of the way up since the trail was steep, and I made it to the top of Selden at 3:50am not losing much time, staying 1h40 ahead of schedule. 45h30 / 210km / Bear Ridge: The night was long on the descent toward Bear Ridge, and I lost a little extra time due to exhaustion, but I was waiting for the sun to rise again to get some more rest. I then arrived at Bear Ridge at 7:30am, 1 hour ahead of schedule, with the sun already hitting my face. The return of the sun gave me some energy and kept me awake, since I did not feel the need any longer to have some sleep. I kept pushing towards Silver Pass for another day, which I knew would be again very difficult depending on my throat situation. 50h30 / 228km / Silver Pass: I skipped a planned 5hours nap and took only 40min instead, making sure to eat properly, but did not take any sleep at all this time. This gave me a big advantage in my planning that I would need later, since I was expecting the worst to happen. I started to climb Silver pass at 9:15am, and as I expected, I was again not able to breathe due to the heat and the steepness of the trail, my throat being very painful again, even worse. It is now very hot around here, above 25degre C for sure. This climb was the worse I felt along the entire trail, I was suffocating every meter, and it felt like I would never get to the top. I lost much time, arriving at the top at 12:30pm, but now staying 5 hours ahead of schedule thanks to the break I skipped. 55h20 / 245km / Duck Pass: I then went down ok, but faced again same breathing issues going up Purple Lake, and from that, every small uphill were not manageable, were I had to stop every single meters as soon as it was slightly going up. I lost precious time. I was waiting to reach Duck Pass junction, since I knew it was then all downhill, and the 3rd night was coming again. 58h / 260km / Reds Meadow: It is now 7pm, the sun is going down, and I decided to take a 1hour break near Dear creek, getting about 30 min of sleep, before starting another full night. I finally reached Reds Meadow at 10pm, This is it! I know now that I did a lot better than last year, covering the same distance, in a faster time, and feeling a lot better, I still can run, last year I was not able to walk. I am now 3 hours early compared to record pace, even 5 hours if I skip the next planned break, and I still feel very strong. I start to feel the adrenaline, getting emotional, this is getting real, I am maybe going to get this record in the end, and I start to believe it very strongly now. I was even considering chasing the time from Leor or Darcy since I felt in good shape, which was about 3hours faster than Andrew. I was sure it was going to be a piece of cake, I have done the most difficult high passes, and it is then all downhill, so my throat will not bother me anymore, there is no chance I will fail this time. I WAS WRONG! 76h45 / 302km / Donohue Pass: I did not know the Donohue pass segment, and it is not a downhill segment, and maybe I should have looked into a bit more to understand what to expect. I left Reds Meadow, and I was not racing anymore, I was just walking towards the finish, still 100km away, like if I was picking up some mushrooms, but I got time, who cares right ? I know I am going to finish in a record time already. I got bored on this trail by night that I did not know, and I saw my brain starting to wire differently due to the lack of sleep. I started wondering very weird things, the existence of this trail, where does it want to bring me, why is it going up and down, is there any project or purpose behind ? Where is north, where is south ? My imaginary started to play me tricks, replacing my two feet by something similar to two “minions”: my feet became two teammates, they were talking an unknown language in my head, “blablabla, blablabla”, I just understood that they were complaining about being out there on the trail, working for me, suffering a big amount of pain for me. I felt sorry for them. When I stopped for small breaks they stopped to complained, and they started again when I was moving. Then I felt being on a rollercoaster, I was driven by the trail, not deciding where I was going, my body moving forward by itself attracted by the trace of the trail. Everything on my side was moving away, and it all looked similar, trees and rocks, and I felt I was in an infinite circle, not making any progress at all. I was doubting I was in the right direction, how could I know? I stopped sometimes, and when I started again, I did not remember for sure the direction I came from. I don’t believe my watch anymore, it is trying to lie to me, I know it, since the green dot did not move much, but I know I made more progress than what it said. I don’t believe you watch anymore, you are trying to make me fail. But what can I do? I am going to follow what you said, even if I lost confidence in you, I have no other choice, I need to move towards somewhere, towards what you are showing me event if it looks very far. And you all trees and rocks, don’t watch at me like this, you are making yourself looking very similar to confuse me and make me think I was there already, but no, I am making progress, I know it. They annoyed me very much being all very alike. I am losing it all, I am not thinking straight anymore, I could not manage my pace anymore, could not make any calculation on where I am, and how fast I can finish. I am now running randomly sometimes, and stopped eating and drinking, this is for wise people, not for me anymore. I looked at my watch over and over again, and I try to analyze this, but I am losing faith, even though I was still making good progress, I was not aware of it. I then see a hiker at 5am next to a lake called “Thousand Island”. I remember this name, but no idea where Donohue pass is. He tells me about 7 miles, while I was hoping 2 at maximum. This killed me. I lay down on the frozen floor waiting for the sun to rise, I am done, I mentally quit. I wake up at 6:30am, “I cannot quit!” I am shouting to myself, “Go Get it!”. I start again moving, but it has been now about 6 hours I did not drink or eat anything, I have no energy anymore, I am extremely weak, and I am still not thinking straight, not doing my routine before a break. This is too late, I lost it all. I fall asleep again, and around 11am, I decided it was time to start quitting the trail. My legs felt now terrible, and the nearest road was at 35km! I make my calculation, it is about 10 more hours of walking. So be it. I made it over Donohue Pass miserably with no energy, but the throat is now cleared (really? Now that I gave up?). I am very satisfied about how things went, I am now confident that I was physically ready for it despite my previous knee injuries, and I have for once made the nutrition a success. Sleep deprivation and lack of knowledge of the Donohue segment, and over confidence at Reds Meadow, were enough reasons for me to fail at finishing the JMT. I am going back next time, with the same gear, same food, same strategy, same everything, in 4 days 3-night length, trying to make it as far as possible. Just little extra knowledges on this last segment, little extra sleep at Reds Meadow, and being humbler and more careful, will help me next time I hope very much. And also, maybe some Vaporub to add to the gear list for preventing or curing the throat, or any advice? Thank you again for reading this and for the support, the mental and physical suffering during the training and during the JMT are all rewarded by the support I get around me. I'm going back for a third unsupported attempt this tuesday sept 11th, starting again at 10am. Hello! Tomorrow morning at 7 am I depart for a NoBo Sub-4 day unsupported attempt on the JMT. My primary objective is to go sub 4 days, complete the trail and have fun! If I am feeling good I will shoot for the for the FKT that was hardened last week. My tracking link is below.